If you met me only two years ago, there is no way you could have guessed that today I’d be able to make a living from nine different sources, across varied fields such as software and game development, photography, writing, self-help guidance, eCommerce, etc. Back then, all I did was build software for a living. Not that there’s anything wrong with that but I personally wanted more. I wanted to learn more things faster, yet I had no idea how. Since then, I’ve learned more than 40 new valuable skills; many of them I can use to make money, meet new people, and build stronger relationships. The more smartly-practiced skills you learn, the faster you’ll learn other connected skills. When’s the last time you spent some time thinking about your learning experience for a given skill? I’m not exaggerating when I say the majority of people stopped at age 12 or below. Studies show that kids lose the vast majority of their curiosity by the age of 12. The short explanation is that when you start school, you don’t have to think creatively anymore on how to solve problems. You are told what to think,what home-works to do, what tests to take, etc. Even for people who do continuous education, most of them just blindly follow a curriculum laid out by a “teacher” who “knows” how to “best” learn a subject. Remember how you learned to ride a bicycle as a kid? Right! You watched and tried on your own. You failed. Many times. You tried again the next day. And guess what? A few days later, your brain started making the right connections for you. You practiced the way that worked best for you. You didn’t follow a YouTube tutorial you found on “the best way to learn how to ride a bicycle”. You didn’t practice this one method you found online over and over again until it worked (or ultimately didn’t). This is probably the most important concept to understand. Skills are physical connections in your brain. We can call a group of connections a “chunk”. A skill is a combination of multiple chunks in your brain. Each from the list above is one or multiple chunks of connections in your brain. Now, let’s say you have become pretty good at throwing a basketball. What’s another skill you think might be easier now to learn? Right, a skill that uses the same chunks! Now that you know how to flex your legs and jump, it’s much easier to perform a long jump. In fact, without these chunks, there’s no way you could do that! See what I mean with connected skills? Some skills can’t be learned until you have a learned a “subset” of that skill. Just as you can’t ride a bicycle before you know how to walk, you can’t simply learn any skill in any order. That’s why when you try to learn the “best” way, it won’t necessarily work for you because the “author” of the said “best” way will likely have very different chunks formed in their brains than yours. How can you be smart about your learning and how do you find the right connected skills to learn any new skill faster? The answer lies in the header above. Most people are not aware of all the skills they’ve learned (chunks in their brains) and how they relate to each other. Truthfully, I’m not fully aware either but I’m working on that. These are obviously very basic examples but I’m hoping they illustrate the idea clearly. 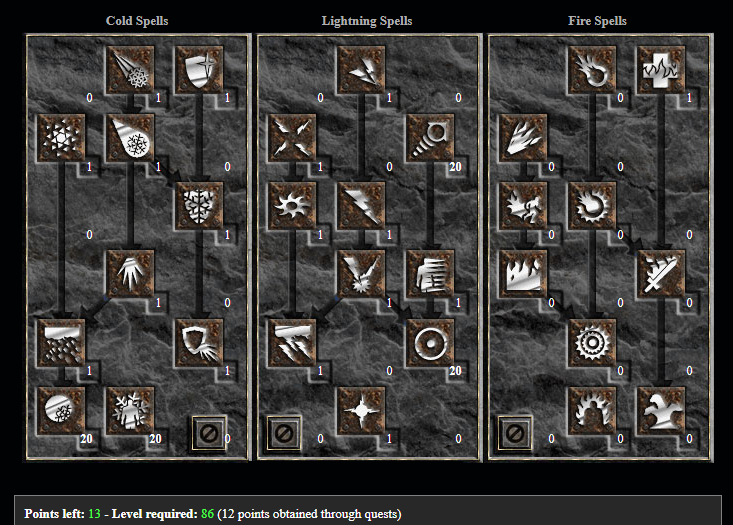 The Sorcerer in Diablo 2 has three areas of “mastery”: cold, lightning and fire. Let’s call each of them a Skill Tree. The skill at the bottom cannot be learned until you have some mastery of the skill above. Like our Walking example from above, you can’t learn to walk until you know how to stand reasonably well. That number signifies mastery of a given skill. In this case, 20 is the maximum. If we look back at the running and jumping skills from above, you’ll notice how I noted “More advanced” body balance. In order to run or jump, you need to be better at balancing your body weight than if you only know how to walk. See the arrows pointing to it? They come from completely different branches. A real-life example could be the Long Jump idea from above. You can’t do a long jump until you know how to run (a branch) and how to jump (another branch). The following sections will explain why the theory is important and how to bring it into practice. Knowing your skill mastery and the direction they’re going gives you the clarity on what to learn next for maximum learning efficiency. Some of you may be familiar with my SkillUp approach. Basically, I learn 3 new skills a month, practicing every day for 30 minutes each. Every month, I go back to the drawing board and try to figure out what skills I should learn next. It’s not as easy as it sounds. Sometimes I choose simply for pleasure, sometimes for work, sometimes to advance a certain branch of a tree. Document classification using Machine Learning. These are very personal and are specific branches of a larger branch or tree. Any of these skills might be either easy or hard for you depending on your level of mastery in “prerequisite” skills. While I had no art knowledge, I’m at max level in “Mouse Handling” and at level 2 (out of 4) in Photoshop. Learning to draw using my previous skills was achievable in 15 hours of deliberate practice. At the end of the month, I went from level 0 in the skill to level 1+. If you decide to pick up the same skill but have never used Photoshop before, you’ll have to work extra hard to learn the skill and it will likely take you a lot more time than I to learn it. Equally, if you’ve never done any programming before, good luck learning how to “classify documents using Machine Learning” faster than me! So why is making your own SkillUp Tree important? 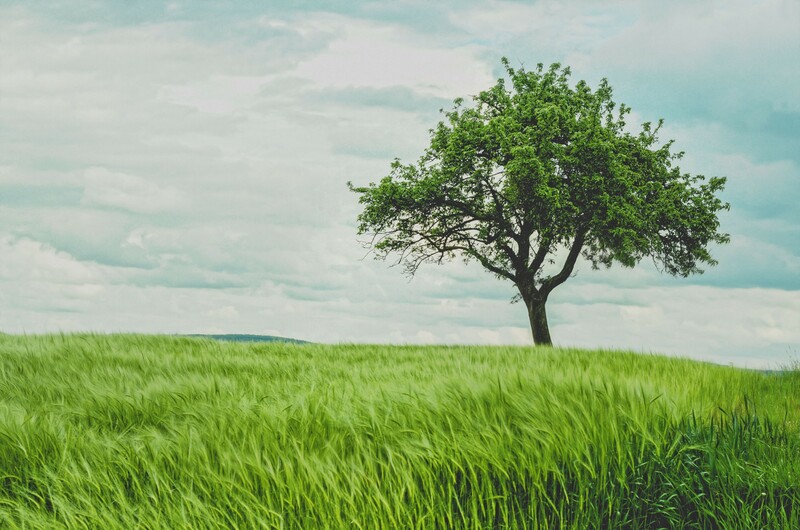 A SkillUp Tree gives you a clear sense of direction and makes it easier for you to judge the level of complexity required to learn a specific new skill. * You should be able to replicate using software like Microsoft Visio or Draw.io. Rectangles: The name of the skill. Scale: The level of competency in the skill (more on that below). Lines: Link between two skills. Number on line: The level of competency required in the previous skill to learn the connected skill. In the above example, I went for a skill that was very broad. I actually don’t recommend building your SkillUp Trees from such a high level, but rather more for a sub-skill you actually want to learn in a short amount of time (~15 hours). What makes for a good portrait photographer? It was a question I had before learning the skill. The answer: it’s a combination of all of the above. A good portrait photographer actually needs strong personality skills to perform. Building the SkillUp Tree forces you to think outside-the-box and truly analyze what it is that encompasses a skill. Your lines don’t need to be perfect on the first draft! Once you’ve built your SkillUp Tree, test it out! Learn the sub-skills you put in there and see if it brings you closer to being better at the “main” skill. If not, simply readjust the tree with new assumptions. Remember, learning is an iterative experience. 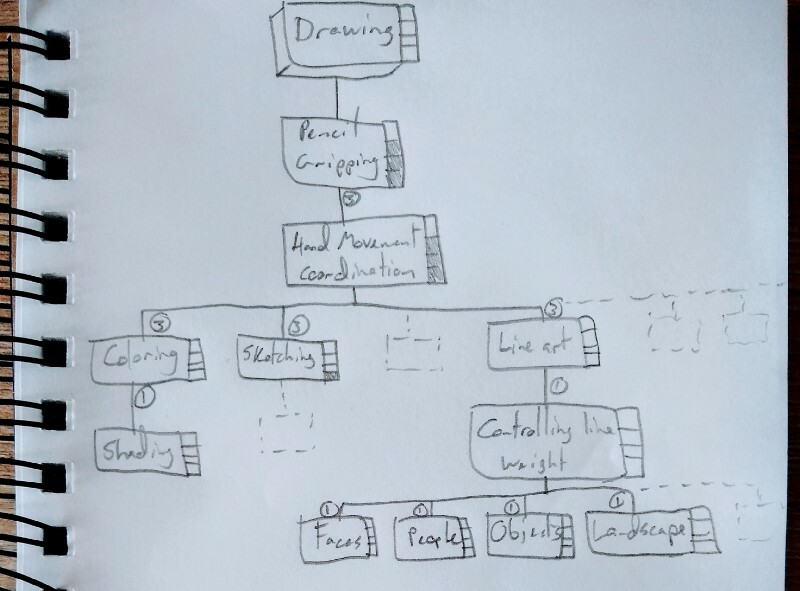 Hope that people will share their SkillUp Trees so we can figure out, at a more granular level, how anyone can learn any skill faster, based on collective intelligence. While the pen&paper version is nice, I feel like we need a tool to make it easier to build, navigate, and make sense of all the information. In addition, such a tool should collect anonymous data to guide other people in figuring out what skills they should learn next, and how. The assembled data would form a collective intelligence and make everyone more skillful. That’s what building your own SkillUp Trees is about. It gives you a clear sense of direction and makes it easier for you to judge the level of complexity required to learn a specific new skill. I hope that, with the information and tools provided in this article, you’ll be equipped to learn any new skills faster. But as with anything, you need to put this into practice. No one knows you more than yourself. So go on ahead and make a list of your current skills and a mastery level next to it. Use any scale of your choice. Turn it into a Skill Tree, or build Skill Trees going forward with new skills. You’ll find that once you have done a few, you’ll have a level of awareness way beyond your peers and will learn that much faster through smarter learning. Interested in the topic? Reach out on dannyforest.com or in the comments section, I’d love to hear your thoughts.